Ideal size to bleed air from brakes. You do need the screw in funnel sold separately to fully bleed the system. Handy size bottle just right for bleeding your brakes, easy to use and great service fom Merlin as normal. Does what it says on the tin... if careful it is possible to gravity bleed without a syringe or funnel (search for Shimano tech videos on You Tube!). Fast delivery, great service from Merlin. 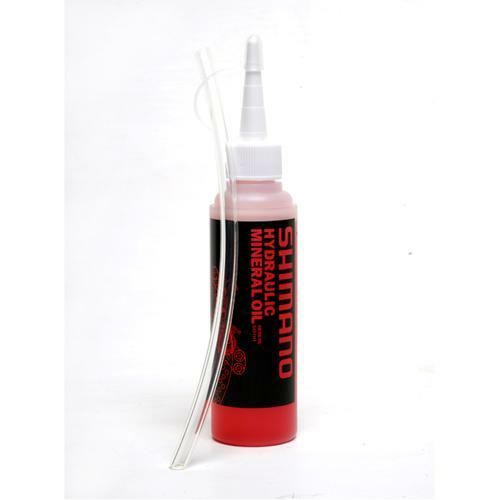 Does what it says on the tin and you're safe in the knowledge you're using official Shimano oil. Usual top service form Merlin too! plenty of oils for a few brake bleeds, but i had to buya syringe separtely. Super quick delivery, simple to use product. Save a fortune in getting a bike shop to bleed your brakes and do it yourself with this! As described, came with everything required, no more spongy rear brake! This stuff leaves fewer bubbles and air traps in the line than cheaper alternatives. Brake Bleeding is a terrible job at the best of times. This makes it much easier. Great little kit, plenty of fluid to bleed both calipers, only thing that would improve the kit would be a longer tube to aid bleeding. Everything you need to bleed your brakes, my own ineptitude meant i will probably need more to complete two full brake bleeds. Works as it should. Handy small bottle that you can shove in your pack, say for example you've been fettling the night before a massive ride and you're not sure about your handy work... like I did. Cleans up nicely and doesn't stain the kitchen floor.